When should a building be a billboard? When it’s got a message worth broadcasting, and when it’s located where a lot of people will see it. You wouldn’t put a billboard building in a delicate residential neighborhood. But near the vast space of an interstate highway, a billboard building can be a thing of beauty. The new Greater Boston Food Bank building - officially, it’s the Yawkey Distribution Center - overlooks I-93 from an edge of Roxbury. This is about the last place you’d expect to see an architectural gem. But that’s what this building is. Drivers have been noticing the building since it opened in April. It faces the interstate with a flat, high, windowless pale silver wall, very much an architectural billboard. 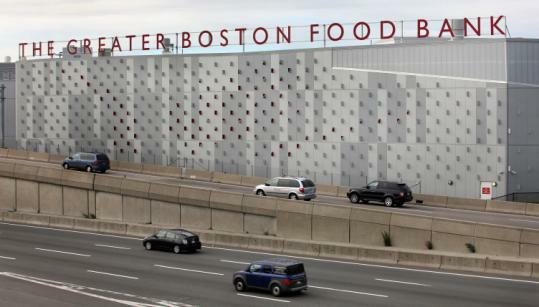 Strung across the top of the wall, in 5-foot-high red letters, are the words “The Greater Boston Food Bank.’’ Way up there in the air, the words remind you of an advertising streamer pulled by an airplane. The wall boasts one other feature: A pattern of 596 little wedge-shaped markers that stick out from the wall, making it look a little like a huge cheese grater. Part red, part silver, the markers remind you of semaphore signals. But there’s a secret code to them, a trick most drivers haven’t figured out yet. When you’re driving south on 93, there’s a split second when all 596 markers suddenly coalesce into a red pattern. It’s the pattern of a wheat plant, the Food Bank’s logo. Before and after that single split second, all you see is a seemingly random field of separate markers. “I’m dying to believe the wheat wall will become an urban legend,’’ says the architect, Tom Sieniewicz of Chan Krieger Sieniewicz. He compares his wall to the famous Dorchester gas tank painted by Corita Kent that may, or may not, include a profile of communist leader Ho Chi Minh. Like the tank, the wall is a deliberate puzzle for drivers. The Greater Boston Food Bank is an amazing place. Although it gets money from the city and state, it’s a private undertaking. It’s essentially a huge warehouse, from which food is distributed to 83,000 Bostonians every week, people who otherwise might not get enough to eat. Every year, 30 million pounds of food leave the building. It’s picked up from the building’s 13 truck docks by vehicles sent from 700 agencies - soup kitchens, shelters, pantries of all kinds. The food, some of it leftovers, is donated from many sources, both governmental and private. Some is also purchased, with donated funds. Volunteers help sort the food. The Food Bank receives about 15,000 volunteer visits each year. Nobody wanted to spend a lot of money on a building with this kind of purpose. “They told us, every dollar you save is two meals,’’ says architect Sieniewicz. The result is a building without frills that is, nevertheless, a delight. The aesthetic is industrial, with steel framing exposed everywhere. But light pours through the interior from walls made of white polystyrene panels, and occasional bright colors play against the steel. One feature, especially, transforms the building from a humdrum warehouse into a work of architecture. That’s a high, skylit catwalk that traverses the length of the interior, with views out to the vast stores of food in the warehouse spaces. The catwalk is the first place the staff takes visitors. Walking it, you feel you’re on parade. The Food Bank harbors one further small puzzle. Inside the front door, carved into the concrete floor, is a rough black circle with a cross inside it. Back in the Great Depression, hoboes would scratch that symbol, using a lump of coal, outside a house where they’d been fed and well treated. It meant something like “Safe Place to Ask for Help,’’ which is what the Food Bank wants to be. Should a building be an architectural message board? It’s an issue that first came up in Boston a few years ago, when WGBH wanted to hang an electronic screen out above the Mass. Pike in Brighton. Boston’s planners worried that the sign would be a dangerous distraction to drivers. They refused to allow it to include either words or moving images. I have no idea why the planners thought the ’GBH sign would be dangerous. Is viewing a screen more distracting than counting cows? Anyway, after WGBH raised the issue, the city established three zoning districts where electronic signs are now considered appropriate: the theater district, the convention center, and the Lansdowne street entertainment cluster. The Food Bank site wasn’t among them. The owners and architect applied for a variance. They wanted the I-93 wall to include an electronic sign. They didn’t get permission. So they invented a billboard that is also a work of architecture, and is thus legal. Creating a building that is able to assert its presence when seen from a speeding car in a vast shapeless setting like this, and to do that without descending into Vegas-like kitsch, is a real achievement. Anyone who’s visited Times Square lately knows that the facades of some of the new buildings aren’t architecture at all. They’re ever-changing, ever-moving digital screens, like giant TVs. It’s a trend we’re going to see more of. I prefer the more solid, less media-driven approach of the Food Bank. Architect Sieniewicz says his building’s message is this: “The community cares. Nobody is going to go hungry in Boston.’’ He maybe sounds a little ’60s when he adds, “The highest calling of an architect is to help the community.’’ At the Food Bank, there’s a solid kernel of truth in that statement. Globe architecture critic Robert Campbell can be reached at camglobe@aol.com.